MoMo 2.0: Hvem er i Paris? ... Who is in Paris? Hvem er i Paris? ... Who is in Paris? Mads og jeg er i Paris denne weekend imens jeg går på mit IB kursus. Vi vil have mange billede at dele når vi tager hjem, men i dag, er mit fokus er med alle mennesker at vi har mødt allerede! 344 mennesker er her, i Paris hos EuroDisney, for et IB kursus, og jeg er i gruppen for "IB Koordinator" så de 30 mennesker i min gruppe er også IB Koordinator i deres skole. Mads and I are in Paris this weekend while I attend my IB Conference. We will have many pictures from our trip that I will share when we get home, but today, my focus is on all the people that we have met already! 344 participants are in attendance at the IB Conference here at Euro Disney and I am in the group for IB coordinators which means that all 30 people in my group are basically doing the same job I am doing in their individual schools. Vi har lært så meget allerede om vores job som IB Koordinator, men jeg ville at fortælle anden ting at jeg har lært... "Hvad ordet INTERNATIONAL betyder!" I min gruppe, har jeg 29 andre mennesker som kom til Paris fra SYTTEN FORSKELLIGE LANDE! Som vi introducerede vores selv, skrev jeg hver menneskes lokation og var jeg forbløffet efter jeg så min list! Og til mig, er det så godt at vi kan snakke EN TING (IB) og forstår hinanden fuldstændigt, selv om vi bor og arbejder i så mange forskellige stede! Jeg er spændt om dag 2 og 3! We have learned so much about our jobs as IB Coordinators already but I want to tell another thing that I have learned...."what the word INTERNATIONAL looks like!" In my group, I have 29 other educators who came to the conference from SEVENTEEN DIFFERENT COUNTRIES! As we introduced ourselves, I wrote each person's location and I was amazed when I saw my completed list! And to me, it is so neat thtat we can all sit and talk about the SAME THING (IB) and completely understand each other even though we all live and work in such different places! I am looking forward to day 2 and 3! Norway, Switzerland, Italy, Poland, England, Scotland, Morocco, Romania, Russia, Finland, Germany, Spain, Egypt, Turkey, Libya, Wales & Denmark! And 4 of us are Americans who are now living in Egypt, Morocco, Switzerland & Denmark now! Vi mødte også en menneske mere... Og Mads var MEGET spændt! We have also met one other person.... about which Mads was VERY excited! I could probably do some intense internet searching... but you are so very good at explaining things... What is IB? International.... baking? banking? building? beets? And how does that translate into working at a high school? We hope you enjoy your conference. Sometimes we think that the American schools should be Europeanized. You just gave perfect reasons to do that. We haven't set the standards very high. Sharon's daughter is the principal of a school, and she is still doing cafeteria duty, and hall patrol--not because she wants to, but because she has to. Love Mads' new friend! Sounds like an outstanding opportunity to learn about your new job and meet lots of new people. ENJOY! wow that is a lot of people!!! at that and very cool that you all just got to talking about the same thing right away!!! with that its really cool to see that there are others like your self who have moved from america to other country's and are continuing to teach. then being in the most romantic place on the most romantic day wow... that just be amazing!! have fun!!! That's a much happier picture than the last time you two were at a Disney park! When we were at IB training in Houston, there were people from Sri Lanka, the West Indies, Jamaica... really fascinating. That is something really cool about IB-- it really IS international. It's so fun to read how excited you are over your job Kelli!!! I can imagine how amazing it must feel to connect with so many people from so many countries over the same subject- a subject you obviously are passionate about!!! Did he get a picture with the Danes favorite Disney character "Anders And" too? I'm so glad that you have had such a great time at the conference. It's really fascinating that there are 4 Americans from 4 different countries there. Very cool!! Happy Valentines Day! I can't think of a more perfect place on this planet to spend it than in lovely beautiful and romantic Paris. I cried when I went to Disney and met Mickey Mouse, I wept uncontrollably. It was a huge surprise, and I didn't expect it. I also wept when I met Bryan Adams, and I don't even like his music. Good for you Kelli. Such an event is always interesting. Tut anr are in Sweden on business the next fourteen days. 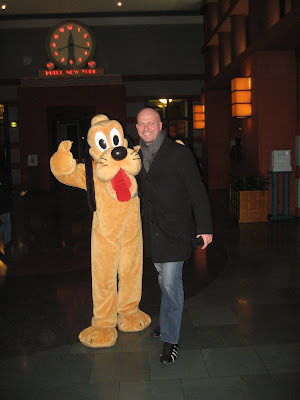 Did Mads kiss cheeks with Pluto since they are in France? The mnemonic contest over at my site is still open! It closes tomorrow, Tues, at midnight - if you want to enter.